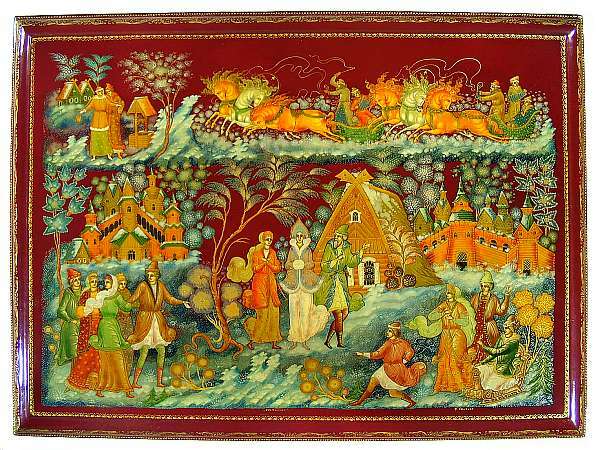 This massive work from Palekh features the favorite tale, "The Snow Maiden," while incorporating several other popular themes. The rich burgundy background immediately catches the eye, and creates a lavish contrast with the gold decoration. Pale blue, shimmering with silver capture the frosty sparkle of winter. 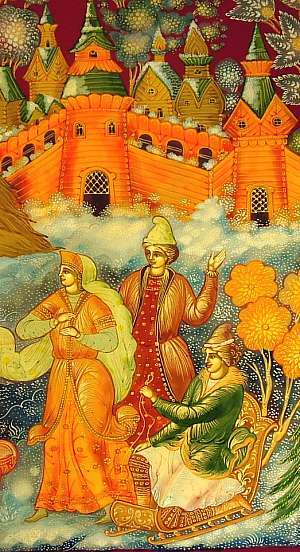 At the center, the elderly couple marvels at the enchanted Snow Maiden, who is an answer to their prayers for a child. Their joyous cries have attracted the neighbors, as a good deal of the village turns out to meet the beautiful stranger. A group of young people cajole each other into saying hello to the Snow Maiden, each trying not to show their shyness. A family passes by on a sledding excursion, the youngest pointing and shouting at the newcomer. Life goes on as usual in the rest of the village. The water must be fetched, but a little flirting at the well never hurt anyone! Adding to the festive feel are a pair of troikas, racing gaily along the top of the scene. Intricately detailed buildings round out the scene, their angles and lines balancing the soft roundness and curves of the foliage. 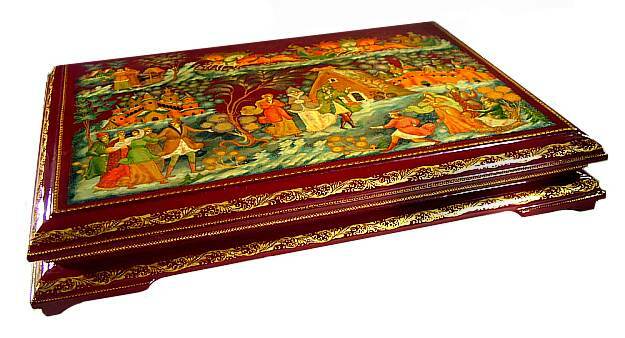 This box is made of high quality papier mache and is signed on the lid with the title, artist's name (V. Smirnov), village, and date of completion. There is a hinge at the top, and the interior is red lacquer. It rests on four curved legs. A magnificent piece that is sure to be the focal point of any collection.